Lehigh Valley, Pa. - The Philadelphia Flyers have announced today that they have loaned forward Corban Knight to their American Hockey League affiliate, the Lehigh Valley Phantoms. Knight, 28, played three games for the Flyers this season before being placed on injured reserve on October 28, 2018. It was his first stint with Philadelphia after spending the past two seasons with Lehigh Valley. 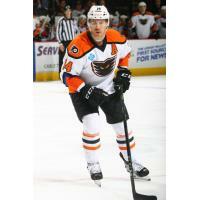 Knight tallied 25 goals and 52 assists for 107 points and a +28 rating in 130 games with the Phantoms. Originally drafted in the fifth round (#135) in the 2009 NHL Draft, Knight had his rights traded to the Calgary Flames and made his NHL Debut on March 5, 2014 against the Ottawa Senators. Knight played nine games with Calgary and 92 games with their AHL affiliate (Abbotsford Heat/Adirondack Flames) before being traded back to the Florida Panthers on January 9, 2015. The 6-foot-2 center played 20 games with the Florida Panthers notching seven points (2g, 5a) and also spent 69 games in the AHL with the San Antonio Rampage and Portland Pirates. A native of Oliver, BC, Knight played four seasons at the University of North Dakota. He won three WCHA Championships with North Dakota (2009-10, 2010-11, 2011-12). Knight was a Hobey Baker Award finalist during his senior year (2012-13) after a career-high 49 points (16g, 33a) in 41 games. Overall, he totaled 146 points in 161 games during his NCAA career. The Phantoms are coming off an incredibly successful fourth campaign in the Lehigh Valley playing at the state-of-the-art PPL Center in which the team claimed the Atlantic Division Championship and finished with the AHL's second-most wins (47) along with the league's second-highest standings points total (104) while advancing to the third round of the Calder Cup Playoffs for just the fourth time in franchise history.